Master of social media, Mark Hamill took a break from trolling Star Wars fans over the Thanksgiving holiday and instead shared some humorous messages along with a heartfelt tribute to the late Carrie Fisher, his on-screen sister. The Luke Skywalker actor shared some Star Wars Thanksgiving-themed memes featuring Porgs taking over the holiday as well as Darth Vader cutting a turkey with his Lightsaber and a cornucopia featuring BB-8, among others. Those tweets were all well and good and gave fans some laughs while celebrating, but it was his tribute to Carrie Fisher that really got everybody's attention. It's hard to believe that The Last Jedi is less than a month away, but it's even harder to fathom that it's been nearly a year since we lost Carrie Fisher. It's tough for fans, but immensely harder on those who knew and loved her, like Mark Hamill. 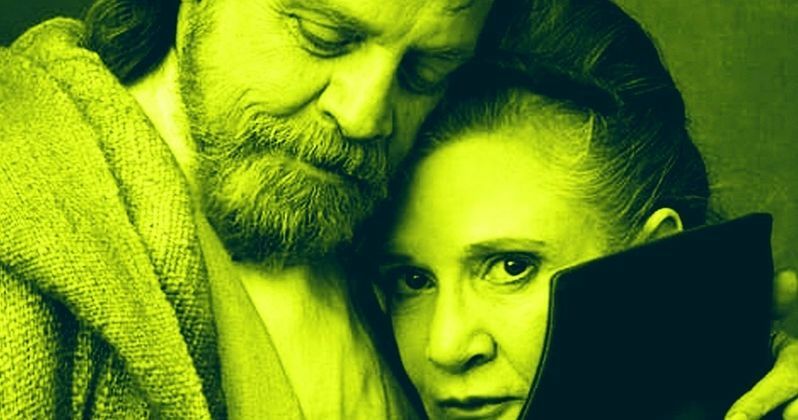 Hamill took to Twitter to post a picture of himself and Fisher, in character as Luke and Leia, on the set of The Last Jedi with a simple caption that reads, "thankful 4 the memories," in hashtag. The picture is a reminder that Carrie Fisher's memory will live on in the hearts of her friends and family as well as all of the Star Wars fans all over the world. "The only way I've been able to cope is to think of her in the present tense. She's so vital in my mind even today." Hamill also went on to talk about how their relationship wasn't always perfect. The actor even revealed that he thought that Fisher would completely bounce back after suffering cardia arrest last December. He explains. "We had our ups and downs. She was almost like a real sibling because I loved her deeply, but she could be so exasperating. When she went into cardiac arrest, it never occurred to me that she wouldn't bounce back. I just thought, 'Well, she's got her next book written.' She'll call it A Piece of My Heart or something acerbic and witty." Now that the holiday is over, expect Mark Hamill to right back into full-on master Star Wars troll, stoking fan theories and leaving more laughs than answers to our questions. The Last Jedi launches into theaters on December 15th, and it's already projected to be a monster at the box office crushing records in honor of Carrie Fisher. You can check out the Thanksgiving tribute to Carrie Fisher below, courtesy of Mark Hamill's Twitter account.